In this photo, Cyrus Leland Jr. is standing behind Governor Willis J. Bailey and Judge W. Stuart who are sitting in chairs. 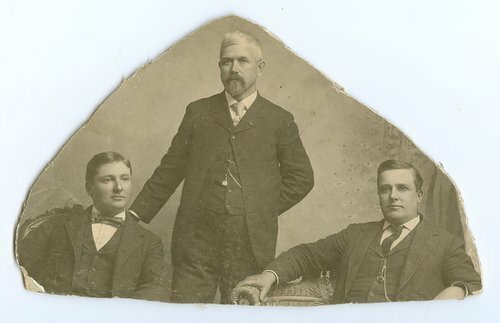 Cyrus Leland Jr. (1841-1917), was born in Sauk County, Wisconsin and came to Kansas in 1858. He served as a lieutenant with Company F of the Tenth Kansas Infantry. He was a member of the Kansas Legislature from 1865 to 1866 and again from 1903 to 1907. Beginning in 1866, he operated a store in Troy, Kansas, and served many years as county commissioner and member of the Republican national committee. Appointed by President Benjamin Harrison, Leland was collector of internal revenue for Kansas, Oklahoma, and the Indian Territory from 1889 to 1893. Leland was named Missouri Valley pension agent by President William McKinley, a position he held from 1897 until 1901. He died in a St. Joseph, Missouri, hospital.